The regalia were used together for the coronation of Scottish monarchs from Mary I in 1543 until Charles II in 1651. They were used to represent Royal Assent to legislation in the Estates of Parliament before England and Scotland were unified under one parliament in 1707, at which time the Honours were locked away in a chest and the English Crown Jewels were adopted by British monarchs. They were rediscovered in 1818 and have been on public display at Edinburgh Castle ever since. The Honours have been used at state occasions including the first official visit to Scotland as monarch by George IV in 1822 and the first such visit by Elizabeth II in 1953. The Scottish Parliament was founded in 1999 and the Honours are used there once again to represent Royal Assent. There are three primary elements of the Honours of Scotland: the crown, the sceptre, and the Sword of State. The gold crown, decorated with gems and pearls, is Scottish, and the sceptre and sword were gifts from the pope made in Italy. They also appear on the crest of the royal coat of arms of Scotland and on the Scottish version of the royal coat of arms of the United Kingdom, where the red lion of the King of Scots is depicted holding the sword and sceptre and wearing the crown. Robes, a pair of spurs and a ring also had been part of the Scottish regalia, and queens consort had their own consort crown, none of which survives today. The secondary Honours comprise a silver-gilt wand, three items of insignia and a ring once owned by James VII added in 1830, and a necklace with a locket and pendant bequeathed to Scotland by the Duchess of Argyll in 1939. Use of regalia by monarchs in Scotland can be traced back to when Britain was converted to Christianity in the Middle Ages. In the earliest known depiction of a Scottish king wearing his symbols of sovereignty, King Edgar wears a crown and bears a sword and a sceptre on his Great Seal; he reigned from 1097 until 1107. His son, Alexander I, is shown holding an orb – a pictorial emblem of divine kingship that was not actually part of the Scottish Honours. By the reign of John Balliol, the regalia consisted of a crown, sceptre, sword and ring. After the English invasion in 1296, the regalia and Stone of Scone, upon which monarchs of Scotland were invested and crowned, were captured by the English army and taken south to London. New items were made for subsequent coronations, and these were gradually replaced during the 16th century with the current set of Honours, consisting of a crown made in Scotland and a sword and a sceptre both made in Italy and given to Scotland as papal gifts. A consort crown was made for Mary of Guise, wife of James V, in 1539; it does not survive among the Honours. The monarch's regalia were first used together by Mary, Queen of Scots in 1543. By the second half of the century, they represented royal authority in the Scottish Parliament, and Acts of Parliament were given royal assent when the monarch or one of his or her commissioners touched it with the royal sceptre. Spurs – emblems of knighthood and chilavry – were presented to Charles I at his Scottish coronation in 1633; the spurs and coronation robes also have been lost. The Honours were last used at coronation in 1651 by Charles II. His father Charles I had been overthrown and executed by order of the Parliament of England, which ordered almost all of the English Crown Jewels to be melted down and struck into coins. However, the Honours of Scotland were hidden, firstly in Dunnottar Castle, which was later besieged by the New Model Army, and from where the Honours were smuggled out; secondly under the floor of Kinneff Parish Church, to be recovered after the Restoration of the monarchy in 1660. Although they had been found, the Honours were no longer used to crown Scottish sovereigns after Charles II. Until the Acts of Union 1707, which united the Kingdom of Scotland and the Kingdom of England to form the Kingdom of Great Britain, the Honours of Scotland were taken to sittings of the Parliament of Scotland to represent the monarch, who lived in England since the Union of the Crowns in 1603. 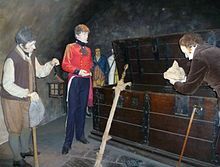 After the Act of Union, the two parliaments having been dissolved, the Parliament of Great Britain sat in London; the Honours of Scotland, having no symbolic role in the unified British Parliament, were locked away in a chest at Edinburgh Castle. There they remained, almost forgotten, until 1818 when the future George IV, acting as Prince Regent, issued a royal warrant authorising the historian Walter Scott and a group of officials to break down the wall of the ancient Crown Room on 4 February. Half expecting to find the oak chest empty, they were relieved to open it and discover the crown, sceptre and sword exactly as they had been left 111 years earlier. The Royal Standard was hoisted above Edinburgh Castle in celebration of the historic moment. Cheers of excitement rippled through the castle, and members of the public gathered outside to hear the news. On 26 May 1819, the Honours went on public display in the Crown Room. They were guarded by two veterans of the Battle of Waterloo dressed in a Tudor-style Yeoman's outfit. George IV was crowned king in 1821 and his visit to Scotland the following year was the first by a monarch since 1651. On 12 August 1822, the Honours were escorted in procession to the Palace of Holyroodhouse. There was a carnival atmosphere, with people lining the streets and observing from windows. Three days later, the king arrived at the palace and symbolically touched the regalia. Before leaving the country a week later, he took part in a return procession to the Castle, where the Honours would remain until the 20th century. In 1911 the sword was carried before George V at the official opening of the Thistle Chapel in St Giles' Cathedral, Edinburgh – the first time any of the regalia had left Edinburgh Castle since 1822. During the Second World War, the Honours were hidden at the Castle owing to fears they might be lost if the UK fell to Germany. The crown and Stewart Jewels were buried under the floor of a water closet, while the sceptre, sword and wand were hidden inside a wall. The only officials who knew of the hiding places were George VI, the Scottish Secretary of State, the King's Remembrancer, and the Governor General of Canada. In 1953, they were presented to the newly crowned Elizabeth II at a National Service of Thanksgiving in St Giles' Cathedral. Keen to avoid the service being interpreted as a Scottish coronation, Winston Churchill, then Prime Minister, advised the Queen to dress with relative informality. From 1971 until 1987 the sword was used at the installation of a Knight of the Order of the Thistle, Scotland's highest Order of Chivalry. 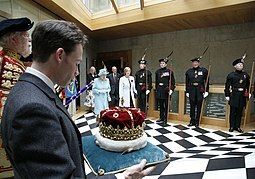 When the Stone of Scone was returned to Scotland in 1996 it also was placed in the Crown Room alongside the Honours. During renovations in the 1990s, the Honours were temporarily stored at an anonymous bank in Edinburgh. The Crown of Scotland was present in May 1999 at the first sitting of the devolved Scottish Parliament. It was carried on a cushion, the official reason being that it was too fragile for the Queen to wear. 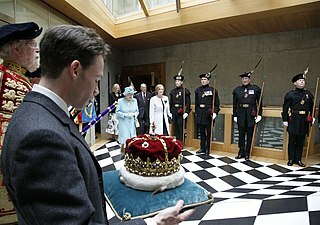 The crown was present again in October 2004 at the opening of the new Scottish Parliament Building and at the opening ceremonies of each new session of the Scottish Parliament. In 2018 plans were announced to renovate the "past its sell-by date" Honours exhibition and improve accessibility. It is not known exactly when the original Crown of Scotland was made, but it can be seen in its pre-1540 form in a portrait of James IV in the Book of Hours that was created for his marriage to Margaret Tudor in 1503. Arches were added to the crown by James V in 1532, making it an imperial crown, symbolising the king's pretensions of being an emperor of his own domain, subservient to no one but God. Arches first appeared as pictorial emblems on coins under James III, who in 1469 claimed "ful jurisdictione and free impire within his realm". In 1540 the base was melted down and recast by the Edinburgh goldsmith John Mosman with the addition of 22 gemstones to the original 20 and an extra 1.2 kilograms (41 oz) of gold. James V first wore it to his wife's coronation in the same year at Holyrood Abbey. It weighs 1.6 kilograms (3 lb 10 oz) and the base is decorated with alternating fleurs-de-lis and crosses fleury. Two gold arches, preserved from the original, are surmounted by a gold monde enamelled blue with stars representing the night sky. On top of the monde is a cross decorated with black enamel, pearls, and a large amethyst. A purple velvet cap was manufactured by Thomas Arthur of Edinburgh; this was changed to a red cap by James VII (1685–88), and the present cap dates from 1993. Four gold ornaments with a large pearl in the centre are attached to the cap between the crown's arches. The Sceptre of Scotland was a gift made in Italy from Pope Alexander VI to James IV in either 1491 or 1494 and was remodelled and lengthened in 1536. It is made of silver gilt and topped by a finial of polished rock. The sceptre includes grotesques and Christian symbols: stylised dolphins – symbols of the Church – appear on the head of the rod, as do images of the Virgin Mary holding a baby Christ, of Saint James the Great, and of Saint Andrew holding a saltire. The Sword of State of Scotland was also a papal gift: Pope Julius II presented it to James IV in 1507 (see blessed sword and hat). It was made by Domenico da Sutri and replaced a native sword that had been made in 1502. The etched blade, measuring 99 centimetres (3.25 ft) in length, includes figures of Saint Peter and Saint Paul, as well as the etched name of Julius II. The 38.7-centimetre-long (1.27 ft) silver-gilt handle bears figures of oak leaves and acorns, with a crossguard in the form of dolphins. It is accompanied by a wooden scabbard which is bound in crimson velvet with silver-gilt repoussé work and hung from a woven silk and thread-of-gold belt that has a silver-gilt buckle. 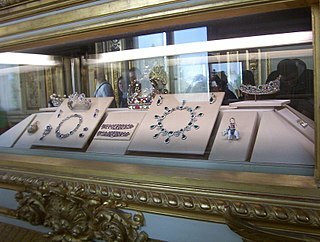 Since 1818 the coronation regalia have been supplemented in the Crown Room with other pieces of ceremonial jewellery. Alongside the crown, sceptre and sword, Walter Scott found a silver-gilt wand. It measures 1 metre (3.3 ft) in length and is topped with a faceted crystal monde surmounted by a cross. The wand has a wooden core and the unknown maker's initials F.G. The object's intended role – if it had one at all – has been forgotten, and its presence among the regalia is still a mystery. Walter Scott thought it may have been carried before the Lord High Treasurer of Scotland. Although the Treasurer did have a mace it was a different shape. Four objects taken into exile by James VII after the Glorious Revolution in 1688 are also displayed: a locket, a Great George and collar, and a ruby ring. They all returned to Britain 119 years later and were given to Edinburgh Castle on permanent loan by William IV in 1830. The St Andrew Jewel of the Order of the Thistle is a gold and silver locket suspended from a ribbon that contains an oval piece of chalcedony into which is carved a cameo figure of Saint Andrew. The cameo is bordered with 12 diamonds. Inscribed on the back is the Order's Latin motto: NEMO ME IMPUNE LACESSIT, meaning "no one attacks me with impunity". Inside is a miniature portrait of Princess Louise of Stolberg-Gedern, wife of Prince Charles Edward Stuart, the elder son of James VII. The object is variously of English, French, Italian and Dutch origin, was altered several times, and measures 6.5 cm (2.6 in) by 4 cm (1.6 in). The Collar and the Great George of the Order of the Garter consist of an enamelled gold figure of Saint George, the patron saint of England, slaying a dragon made for Charles II in 1661 suspended from a gold collar made in 1685. The George is set with 122 diamonds and measures 7.2 cm (2.8 in) by 6.4 cm (2.5 in). The saint's cloak and a large suspension loop are both missing. The collar is 1.57 metres (5.2 ft) long and has 26 alternating knots and enamelled badges, each with a tudor rose in the centre. The Ruby Ring was probably used at the English coronations of Charles I and Charles II, and certainly that of James (known in England as James II). It has a large ruby etched with a St George's Cross and bordered by 26 diamonds applied in the 19th century. Queen Victoria's fourth daughter Princess Louise, Duchess of Argyll, died in 1939 and left a necklace, locket, and pendant to the nation of Scotland. The London-made jewellery was a gift to Louise from her husband the Marquis of Lorne (later the Duke of Argyll) in 1871. The necklace contains 190 diamonds and 13 pearls; it suspends the locket, consisting of a large pearl surrounded by 30 diamonds; from which hangs the pear-shaped pendant, set with diamonds, emeralds and sapphires, having a relief depiction of the Galley of Lorne and the motto of Dukes of Argyll: NE OBLIVISCARIS, meaning "do not forget". Under the terms of a Royal Warrant of 1818, the holders of four of the Great Offices of State in Scotland, the Lord Justice Clerk, the Lord Advocate, the Keeper of the Great Seal of Scotland, and the Lord Clerk Register, are ex-officio Commissioners for the Keeping of the Regalia. The warrant gave the keepers the power to appoint a deputy-keeper and Yeoman-keepers. Accordingly on 8 December 1818 Captain Adam Ferguson was appointed. Since 1996, the commissioners have also been empowered by another Royal Warrant for the safekeeping of the Stone of Scone and for the arrangement of its return to Westminster Abbey for the next British coronation. Wikimedia Commons has media related to Honours of Scotland. ^ "Search results for controlling institution "Commissioners for the Keeping of the Regalia"". Historic Environment Scotland. Retrieved 31 August 2018. ^ Burnett and Tabraham, p. 10. ^ Burnett and Tabraham, p. 12. ^ Burnett and Tabraham, p. 13. ^ Burnett and Tabraham, p. 15. ^ Burnett and Tabraham, p. 25. ^ Burnett and Tabraham, p. 31. ^ Burnett and Tabraham, p. 4. ^ Burnett and Tabraham, p. 47. ^ Bell, William (1829). "Papers Relative to the Regalia of Scotland". p. 51. Retrieved 28 September 2018. ^ Burnett and Tabraham, p. 48. ^ a b Burnett and Tabraham, p. 51. ^ Burnett and Tabraham, p. 50. ^ "Scotland salutes the Queen Honours of Scotland". Moving Image. Retrieved 6 August 2018. ^ Douglas S. Mack in McCracken-Flesher, "Can the Scottish subaltern speak? ", p. 146. ^ "Honours of Scotland and Stone of Destiny". Visit Scotland. Retrieved 6 August 2018. ^ a b Kenny Farquharson (3 February 2018). "Scottish crown jewels will be removed for Edinburgh Castle revamp". The Times. Retrieved 14 March 2019. ^ Robert Crawford in McCracken-Flesher, "The Crown", p. 246. ^ a b Burnett and Tabraham, pp. 24–27. ^ Andrea Thomas in Goodare and MacDonald, "Crown Imperial: Coronation Ritual and Regalia in the Reign of James V", p. 66. ^ Burnett and Tabraham, pp. 17, 22–23. ^ Burnett and Tabraham, pp. 18–21. ^ Burnett and Tabraham, p. 52. ^ Burnett and Tabraham, pp. 52–54. ^ Piacenti and Boardman, pp. 237–238. ^ Piacenti and Boardman, pp. 218–221. ^ Burnett and Tabraham, p. 55. ^ "Scottish Regalia". Parliamentary Debates (Hansard). 1. United Kingdom: House of Commons. 26 March 1981. col. 395W. ^ "Stone of Destiny to stay in Edinburgh Castle". The Herald. 14 December 2006. Retrieved 1 September 2018. ^ "20 lesser known facts about the Stone of Destiny". Edinburgh Castle. Retrieved 1 September 2018. Burnett, Charles J.; Tabraham, Christopher J. (1993). The Honours of Scotland. Historic Scotland. ISBN 978-0-7480-0626-7. Goodare, Julian; MacDonald, Alasdair A., eds. (2008). Sixteenth-Century Scotland: Essays in Honour of Michael Lynch. Brill. ISBN 978-90-474-3373-6. Whatley, Christopher A. (2014). Scots and the Union: Then and Now. Edinburgh University Press. ISBN 978-0-7486-8028-3. Christian Fletcher, Lady Abercrombie, was a Scottish minister's wife who saved the Honours of Scotland from Cromwell's troops during the English invasion of Scotland. A sceptre or scepter is a symbolic ornamental staff or wand held in the hand by a ruling monarch as an item of royal or imperial insignia. Figuratively, it means royal or imperial authority or sovereignty.